My game Proun was recently 'cloned' by an iOS game called Unpossible. 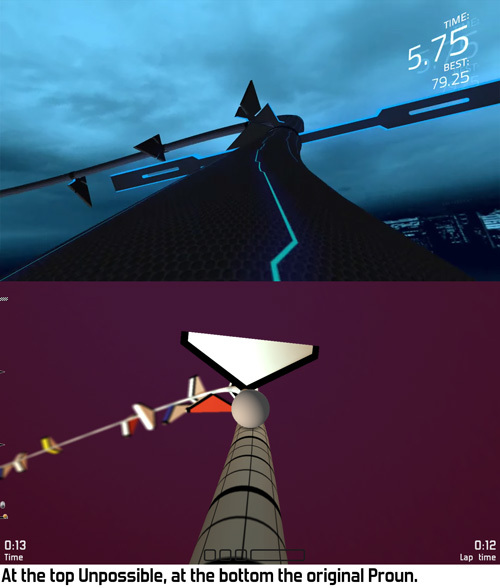 Unpossible isn't the first 'clone' of Proun: games like Synesthetic and Polyrider also copy the core gameplay and many obstacle shapes. Polyrider even goes so far as to copy-paste my main marketing text (DOH!). However, the timing of Unpossible is much more painful as Proun itself is also finally coming to iOS (and Android and 3DS): together with Engine Software I am working on a bigger and better Proun+. Proun+ coming to iOS means that it will be a direct competitor of its alleged clone Unpossible. I saw quite a bit of controversy online about whether Unpossible is a clone or not and whether that would be bad or not, so here is my own take on the matter. I think most people are worrying way too much about most clones. The only clones that should be considered a big problem are direct rips that add nothing and are clearly only intended as a moneygrab. Most infamous clones are not of this type and indie developers should complain less and instead spend that time making more and better games. One aspect that seems completely absent from how indie developers react to clones is pride. Usually your game will only be cloned if you make something very good and different from what already exists. Somehow most indies seem to only notice the negative and don't realise what a fantastic compliment being cloned really is. One of the things I am most proud of in my game development career so far is that Swords & Soldiers and Proun have both been 'cloned' many times and that De Blob has directly inspired other games. Indies should focus more on this positive side of cloning! -The "Asset Ripper" is the worst. These are clones that not just copy game mechanics, but even go so far as to rip assets directly from a game. Graphics, sounds, animations: they are just copied directly. We have actually encountered these ourselves once: a Swords & Soldiers clone had used some of our sound effects in their game. However, this was a small Flash game that was played by hardly anyone so we ignored it and didn't take any action. The "Asset Ripper" is the only type of clone that is definitely illegal, since it violates copyright laws. -The "Art Replacer" is the next step: practically all game mechanics are copied directly and the only things that are changed are the visuals and audio. This is still clearly a clone, but we are already entering a grey area here. If the visuals are changed from a happy fairytale to gritty sci-fi, then the feel of the game itself also changes a lot. It is still lame to copy mechanics directly like that, but this isn't a complete clone anymore and might cater to a different audience. A famous example in this category is Yeti Town, which ripped Triple Town. They switched to a different setting, but the happy feel remained the same. Add that to a literal copying of every game mechanic and rule in Triple Town and it becomes extremely lame. -Finally there's the "Mild Changer". This is the category Unpossible belongs to, as do famous 'clones' like Ninja Fishing. Mild Changers have a lot of similarities to another game, but add not just their own visuals: they also change the gameplay in some small ways. The core game keeps feeling the same, which is why people cry 'foul' so often for these kinds of games, but they do change things and thus create something new. Unpossible is a clear example of this latter group. At first glance this game seems to play exactly like Proun, but it does change some things. The camera goes from third person to first person. This doesn't really make the game feel very different, but it is a real change nevertheless. The cable is thicker in Unpossible, so it is more difficult to see what is coming around bends and what is at the other side of the cable. And most importantly: in Unpossible the game immediately restarts when you hit something, while in Proun you can keep racing. This changes the game quite a bit. Strangely, if a game is part of a genre with lots of existing games, it is considered okay to only change some small things. But if a type of game has so few games that it can hardly be called a genre yet, then suddenly it is cloning and considered problematic. It seems like the general public thinks 'clones' are a problem if few games do it, but if lots of games all do it for years, then we call it a 'genre' and it is okay. An interesting question in such cases is whether the developer of a clone knew the original at all. On the Touch Arcade forums Acceleroto claims to not have know Proun until Unpossible was already playable: "I didn't know about Proun until I shared an Unpossible build with some dev friends." My first inclination is to believe him: when I started working on Proun I also didn't know about F-Zero's Cylinder Wave track. (In case anyone is wondering about 2009's Boost 3D: Proun's first versions are way older than that, as can be seen in this forumpost from 2006.) Despite Acceleroto claiming to not have known Proun, when I actually played Unpossible I started to strongly doubt that. The similarities in types of obstacles and game feel are so incredibly strong that I really doubt whether Acceleroto really didn't play Proun until most of Unpossible was designed, especially considering how 'original' his other games are. At Ronimo we are currently developing Swords & Soldiers II. Do I worry about the many similar games and even clones out there? No, I don't. We are trying to make Swords & Soldiers II better and more fun than the others. If we succeed at that, then the clones won't hurt us. If we don't succeed at that, then we should have made a better game and have only ourselves to blame. Ridiculous Fishing is a great example of this: Vlambeer made their sequel to Radical Fishing so incredibly good that it became a gigantic hit despite so-called 'clone' Ninja Fishing launching much earlier. Another part of handling clones is that indies should simply make better business decisions. 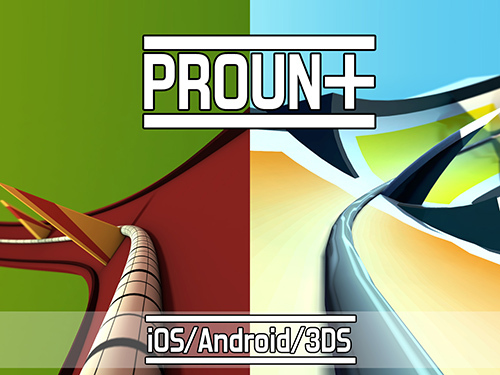 Unpossible will compete with Proun+ on iOS, but this is entirely my own fault: Proun has been out for three years now so I should have jumped on iOS ages ago. Had I done that, then Proun+ would have released well before Unpossible and the whole issue would not exist. This is a situation that often arises around clones: the original developer is very slow at bringing his game to other platforms and when he finally does, he complains that clones have sprouted in the meanwhile. This is especially important with games that are simple to build, like Proun. Ronimo's Awesomenauts and my own Cello Fortress are technically so complex that clones are much less likely to come quickly, if at all. Before we learned of Unpossible we were already adding more variation and originality to Proun+ by introducing new game modes, more music and new visual styles. Seeing Unpossible can only strengthen our resolve to make the best game we can. If we fail at making a better game, then that is entirely our own fault. If we succeed, then I doubt the existence of so-called 'clones' will be all that relevant to sales of Proun+. Interesting take on the cloning issue, Joost. I agree that being angry at clones is akin to howling at the sea, or questioning why the wolf has made the ewe bleat for the lamb. Being prou(n)d instead is a more wholesome conclusion, though I disagree that quality alone is what ultimately causes success in the marketplace. There are cases where the early bird took the worm, despite perhaps not being the best bird in the nest. But from a reasonable standpoint, you are more than correct that the best thing a dev can do is channel his efforts into making the best game possible. You are right that not being first can cause a lot of damage to sales, but what often happens is that (like in my case) the original developer is way too slow to go to more platforms. I should have been on iOS two years ago and then Unpossible would not have been on iOS before Proun. In the end game development is also a business and making good business decisions is as much a part of the game as is making good games. I asked you years ago about doing my own Proun inspired thing and you graciously said to go ahead. I never finished it, so I don't think I sent you anything more. The initial version is at http://www.sea-of-memes.com/LetsCode78/Demos/DontHitMe.html and is WebGL. Just use the arrow keys. Clearly this is Proun inspired, but I doubt it would compete with it, even if I finished it. Something that I touched upon on twitter a little bit was that great things can come out of "Mild Changer" clones. The original Warcraft is my favourite example of this. It actually started out as an "Asset Ripper" clone of Dune II. Warcraft 3 ended up being my favourite game of all time and I'm so thankful that those guys asset ripped Dune II and then ended up with mild changes. Who knows where the RTS genre would be today if it were not for blizzard cloning Dune II. Indeed, This blog is an amazing read, I highly recommend it! On one hand I think I agree with you, but on the other one it makes me feel so sad when I see some developers' original games being shamefully cloned. I'm about to end my first game, and I've always thought that it would be, in some sense, "great" if one of my future games was cloned; as you say, it would mean I've done something good. But at the same time I think I would feel bad, I think it's not something that you can completely control. By the way, I started with the Proun mechanics when thinking about ideas for the game I'm developing, but I've changed them in my mind so much over the time that it's now completely impossible to find any similarities between them. It's ended as a 2D non-racing game; actually, at some point I realized I was creating some kind of Hexagon-like game, when I had been trying not to create a game too similar to any other, ***specially*** to Hexagon... Damn, I guess sometimes it can be a bit difficult to avoid people saying "OMG, you've made a XXXX clone!!1! ", right? Game development often starts from evolving an existing thing, nothing wrong with that. Awesomenauts started as "DOTA platformer", Swords & Soldiers started as "side-scrolling Starcraft". From there both turned into something fresh and original. The problem is if you end up too close to something. This blog is about random interesting things I learn while creating things (usually design, art, code and music for games, and often for Ronimo Games).